Teach your little one as many duties as you can. Charity begins at home and you must start it at home too to see your kids growing into wonderful human beings. Donating clothes, understanding humans, telling the truth, improving grades, empowering the poor and serving the society are some duties that kids should be taught since a young age. 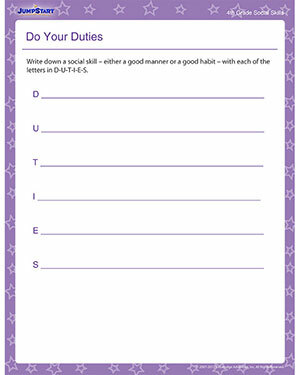 Download the free social skills worksheet for 4th graders for better understanding.